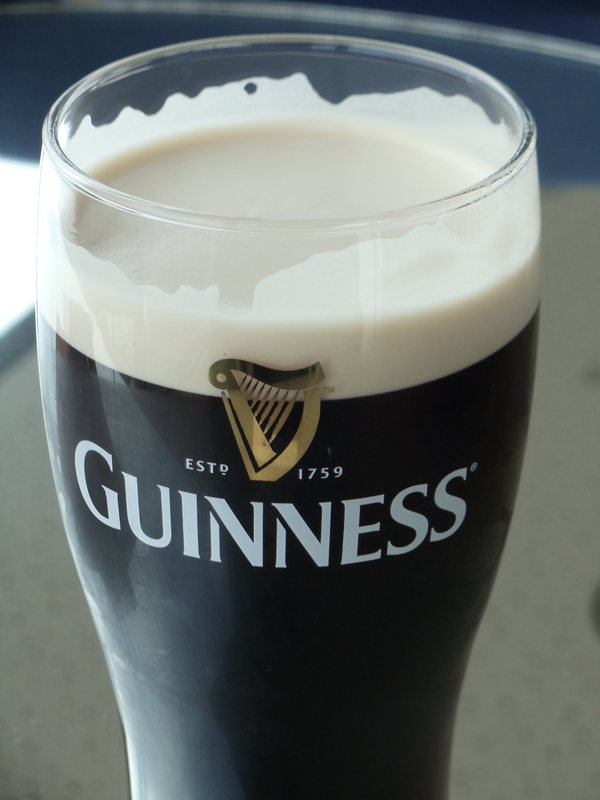 Guinness is without question one of the most recognized and trusted brands around the world. A brand that was established over 250 years ago, and a business that helped an entire nation prosper, it seems like as good a place as any for my first brewery review. I have always had a fondness for Guinness. It’s not a beer that I would order if I was out having a session with the boys, and I wouldn’t recommend one a blistering summer day, but for the right occasion, nothing beats a Guinness. It was always a goal of mine to travel to Dublin and visit the fabled St. James’s Gate Brewery, and in April of 2011, I did just that. I was on vacation in the north-east of England when I took an unbelievably cheap flight from Newcastle to Dublin. To put the cost into context, it was cheaper for this return flight than for a taxi from Pearson to the downtown core. I had never been to Ireland, and had no idea quite what to expect, and I was told two things: Everyone is very friendly and helpful, and that I’d have a great time at Guinness. When I arrived at the hotel, I asked the young girl at the desk which would be the best way to get to the Guinness Brewery, and she gave me a map with the bus routes I needed to take, and made change for me so I would exact fare for my trip. I boarded the first bus outside the hotel and had to make one change in the centre of Dublin before arriving at the brewery. As I waited for the second bus, a nice lady pointed out that I was at the wrong bus stop, and that the stop I needed was about 100 metres down the road. I was told everyone was friendly, and so far, I couldn’t have asked for anything more. As I boarded the second bus, I double checked with the driver to make sure I was on the correct route, and he said he’d give a shout when we reached the stop for Guinness. Only a handful of minutes had passed before the driver hollered, and as I exited, he showed me the quickest path to the brewery. Finally, I was there, home to one of the longest living brands, and home to that sweet, velvety stout. When I arrived, I made my way to what looked like ATM’s. The tour at Guinness is very self-help, as you may only see three or four employees during the entire tour, and a couple of them are in the gift shop and bar. I purchased my ticket, placed it in the automatic gate and made my way into the Guinness Gift Shop. I was in so in awe of the shop itself, I nearly forgot about the tour, and then it happened. Fire Alarms began blaring, and employees wearing hi-vis vests came bursting in from all different directions and escorted all the tourists through the emergency doors. Once outside, we were all taken to a secure car park as the facility was evacuated. We were told we would be outside for ten, maybe fifteen minutes, but once half an hour passed, things took an even weirder turn. Three or four heavily armed vans rolled up to building and a dozen soldiers stormed out. All the patrons in the parking lot were taken inside to a small seminar room and awaited further instruction, and yet no one knew what was happening. About an hour and half after we first left the building, we were allowed back in. Apparently someone had made an anonymous call to the police stating that one of the destinations that Queen Elizabeth II was to visit on her tour of Ireland was compromised. Now let’s be fair, if you were making your first trip to Ireland, wouldn’t you want to go for a tour of the Guinness Brewery? With all the dramatic scenes behind us, I made my way back inside and began the self guided tour. This tour is so much more than the method of brewing beer, or the number of kegs produced a day, but the history of the brand, and what it has meant to Ireland. Along the tour, I came across an old miniature locomotive that was used to move the barley around the brewery on a private railway. On display are countless numbers of old advertising posters, slogans, and mascots. The orignal harp, that gave inspiration to the trademark Guinness Harp is also on display in a glass case. As you make your way from floor to floor, you see a giant glass structure in the centre of the building. At the bottom, buried into the floor is a copy of the famous lease that Arthur Guinness signed back in 1758, for an astonishing 9000 years. But the top is where it all comes together. When you get to the top, and have a look down you can finally see that the glass structure is a giant pint glass, and now, you’re at the top, where you find that rich, creamy head for which Guinness is so famous. Upon reaching the top, you enter a bar, with only one beer on tap, and a breathtaking 360 degree view of Dublin. Upon handing your tour ticket to the barman, he begins to pour you a complimentary pint of Guinness. It takes 119.5 seconds to pour the perfect pint as the bar man fills three-quarters of the glass, and allows it to settle before topping it off. He explained that if poured correctly, a pint of Guinness should taste the same anywhere in the world, but I couldn’t disagree more. That was the best pint of Guinness I have ever had. Period. I sat in the bar enjoying my pint and looking out into the dreary Irish weather when a couple of young girls went to the bar for their complementary pint. Not knowing if they would like it, they split one pint between themselves. By the reaction on their faces, it wouldn’t take a genius to figure out that they weren’t fans, but they politely offered me their spare ticket, so I graciously accepted, not wanting it to go to waste. I could have sat there all day, but with no more free pints coming way, I made an exit, and headed for a meal in the city centre. I had no idea what to expect when I arrived, but the hospitality afforded to me by everyone was beyond anything I could imagine. Should the chance arise again, I’d love to go back and look out over Dublin, sipping the beer so firmly entrenched in its history.